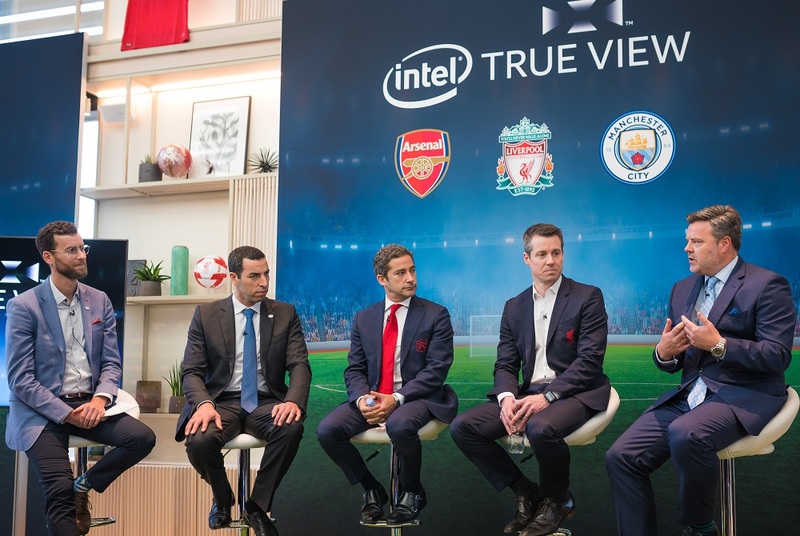 Intel has announced a partnership with Premier League sides Liverpool, Manchester City and Arsenal, which will see the trio pioneer the use of Intel's proprietary True View technology to enhance the fan viewing experience in the UK. Beginning in March, the agreement will see Intel deliver immersive, 360-degree experiences for fans watching matches from Emirates Stadium, Anfield and the Etihad. The tech allows viewers to see every angle of critical match moments in a new dimension and will place fans and broadcasters "in the game", promising to redefine the way people watch Premier League matches. It works by re-creating the action on pitch and presenting it from an ideal vantage point or player’s perspective, using Intel’s data processing capability to deliver to fans. With the benefit of the system, fans will be able to see the pitch from the eyes of the player, while presenters and pundits will have the opportunity to "freeze" moments, helping them to share a new level of insight into tactics and decisions made by players on the field of play. A Laser Wall feature will also offer viewers a clearer picture as to where players are positioned on the pitch during a game. The arrival of Intel True View in the UK has been highly anticipated, particularly among those who have witnessed the benefits of the "volumetric capture" in the NBA and NFL. The system uses 38 ultra high-definition 5k cameras positioned in the stadium, which offer multi-angle views of play, creating 360-degree replays and highlight reels from every angle. Footage is recorded via the cutting-edge cameras that includes height, width and depth of data to produce voxels, pixels with volume. Data is then processed with servers powered by Intel Core i7 and Intel Xeon processors, before the viewpoints are then recreated to form a fully volumetric 3D person or object, rendering a virtual environment. In the UK, the True View experience will be available in-venue in the stadiums concerned, while supporters watching games worldwide via the rightsholders' live broadcast, match highlights or through the clubs’ official website, mobile app or social media will also be able to enjoy goals and other key moments from every angle. James Carwana, Vice President and General Manager of Intel Sports, explained: “Immersive media experiences continue to create more opportunities for sports teams and leagues to put the fan experience first. Commenting on the partnership, Peter Silverstone, Commercial Director of Arsenal FC, added: “We are always looking to find new ways to bring our 780 million fans and followers around the world closer to the action and this partnership will give our fans a whole new view of the game. “We have seen the impact this Intel technology has had in other sports leagues across the world and are excited that it will be installed at Emirates Stadium." Damian Willoughby, Senior Vice President of Partnerships at City Football Group, said: “We love to be first, both on and off the pitch, so we are delighted to pioneer this game-changing technology at the Etihad Stadium. Intel has previously placed its True View technology in NFL and NBA venues, as well as LaLiga teams, including at Barcelona’s Camp Nou, Real Madrid’s Santiago Bernabeu, Atletico Madrid’s Wanda Metropolitano and Sevilla’s Ramon Sanchez-Pizjuan.